My trip to Switzerland began with an amazing first day. 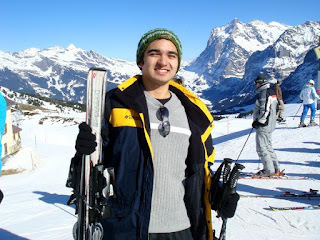 I was high on travel adrenaline, and the momentum of my trip pushed me onto the slopes on my second day. I awoke on the top bunk in my 8-bed hostel room. Beyond the warm red duvet, the air was chilly and crisp. I had the usual hostel breakfast - slightly stale bread with communal marmalade. I bundled up and went to the Interlaken West train station to buy my ticket to the slopes. There was a 2-day pass for unlimited train, cable car, and ski lift use that cost about CHF100 (about $95). Expensive, but seeing how many cable cars, ski lifts, and trains there were, an unlimited pass seemed to be worth it. I would be skiing everywhere all day! Soon my excitement about hitting the slopes would come crashing head-on with reality. And I would be involved in some actual physical crashing myself. The train into the mountains (and the main town of Grindelwald) left from the other train station - Interlaken Ost, which is about a 20-minute walk across town. After buying a couple pieces of fruit and pre-made sandwiches at the Coop near the west train station, I walked across town along the Höheweg, the main street. From there I saw the Victoria Jungfrau Grand Hotel and the Casino Kursaal, evidence that Interlaken has been a resort destination for some time. Before I got to the train station, I realized that I needed a pair of sunglasses (yes, I really was that unprepared!). I bought a simple pair for about CHF15. Soon I was on the train, heading south from Interlaken into the Bernese Alps. The farmlands quickly gave way to deep valleys and then to snow-covered villages. Most everyone else on the train had some snow gear, either skis or snowboards, and the train was equipped with ski/snowboard racks for people to put their equipment. For a Saturday, though, the train was mostly empty. Within half an hour or so I was in Grindelwald. I followed the flow of people from the train station along the main street. I found a large sporting goods store and found all the equipment I needed to ski. They fitted me with skis, boots, and snow pants, which I rented for two days, and I was now set to hit the slopes. I walked out of the store and, well, didn't know exactly where to go. So I just kept following the crowds of people walking uphill, towards the cable car lift. Turns out I was walking the wrong way (though the map didn't say so); I had to return to the train station and take the train back downhill one station to Grindelwald Grund. From there I would transfer to the train going up the mountain. The train wound up the mountainside, chugging along heartily. The gleeful children had their faces plastered to the windows, eager to jump out and enjoy the snow. The train took me up to Kleine Sheidegg. 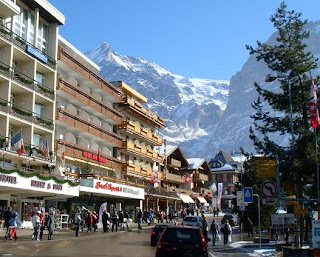 It's a mountain pass situated below the Eiger ("ogre"), which connects with the Mönch ("monk") to the Jungfrau ("virgin"). The story I heard is that the monk is protecting the virgin from the ogre. The Jungfrau is probably the most well-known of the three, such that this area is often called the Jungfrau Region. In fact, there's a train that can take you up to the Jungfraujoch, which is the highest train station in Europe and known as the "top of Europe". That train wasn't included in my 2-day pass, so I didn't go. But there was plenty to see from where I was! It was gorgeous. Absolutely breathtaking, and photos don't do these mountains justice. It was also the perfect temperature, brilliantly sunny and not that cold. I got off the train with my ski equipment. There's a big cafe/outdoor sitting area that I walked by. I was strolling along, when I hear two people were calling out "Jason! Jason!" and waving at me. Huh?! It was Nick and Kara from the night before. They were having a ski day as well and had just stopped for their lunch break. I walked up to them sitting in the bleachers and chatted for a minute before I went off on my own to tackle the Swiss Alps! I was pumped. And I really didn't know how to ski. And skiing the Alps is a painful way to learn. There was a hint that I might be in a little over my head, when I needed the help of a middle-aged Swiss woman to properly lock in my skis. Whatever. I pushed off down the gently sloping ski run. I was cruising, picking up speed and feeling the fresh mountain air breeze around me. There was no one around me - I felt like the only one on the mountain, and I was on top of the world! It felt so good to be away by myself, away from the crowds of the city and trains. 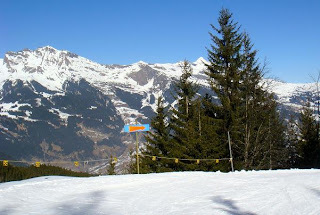 I'm doing this, I thought, I'm actually skiing the Alps! The adrenaline rush was like no other. Then the run suddenly became much steeper and veered off to the left. I lost control and crashed into a snowbank. My left ski flew off and landed 25 feet away. I was jostled and shaken, but still full of adrenaline. I clumsily scuttled over to the lost ski and put it back on. Before getting back up, I had to take a moment to compose myself, because I looked up and saw where the ski run led next: Right into the forest. I took a deep breath and got up. What else was I going to do? There's no other way off this ski run other than straight down. The ski run became narrower and steeper as the wide open spaces transitioned into darker and more chaotic forest. The run began to twist back and forth with a series of hairpin turns, and just over each turn was a precarious drop. I was just barely able to ski over the first couple turns before I wiped out again. If I had wiped out just a few feet further I would have gone over the edge. I was suddenly even more acutely aware of my mortality. I began to think to myself what it would be like to die on the Alps. How would my friends and family find out? There are much less glamorous ways to go. But I didn't feel sad or depressed thinking about it; perhaps it was the adrenaline, but I really felt alive. A couple more turns, and I crashed again. And again. How much longer could this go on for?, I thought. So sitting there, half bruised on the side of the ski run, I reached into my side pocket and grabbed the map I had. It looked like the path I was on (which was marked as the "easy" run) went for 3-4 kilometers. I sat for another minute, as the adrenaline in my system was starting to give way to exhaustion and fatigue. Several groups of skiers passed me, including several families skiing together. There was a kid skiing with his parents and complaining about how bored he was on this run! He whined and shouted that he wanted to ski there, pointing to the incredibly steep glacier across the valley where skiers were careening down at racecar speeds. It was at that moment that I realized that children in Switzerland must be born on skis. I got up, skied, and crashed a few more times. After what seemed like a long eternity bemoaning my imminent death, the forest magically opened up into a broad clearing. And there I saw it: Civilization! I had made it to the next train station with a nearby cafe. My body was bruised, battered, and already turning sore as I sat at the cafe. I was too tired to buy any food or drink; I just needed to get some rest. I watched the Swiss moms and dads cheerily gulping down their beer and wine, their the kids eager to keep skiing. Swiss children and their skis! After several minutes resting, I got on the next train downhill, enjoying the views of the mountains in the mid-afternoon sun. I had a big smile across my face that I couldn't hide. Back in Grindelwald, I returned my equipment and asked for a refund for the second day's rental. I took the train back towards Interlaken. At Zweilütschinen, the two forks of the railway come together, so I had to transfer. However, I thought that I had this unlimited pass for the railway, so I had better put it to use. There, I decided to transfer going the other way, to Lauterbrunnen. Just to see what was there. And there really wasn't too much there. A cable car departed from there to Mürren, but it was close to the end of the day and I wouldn't be able to catch the return train back. Oh well. So Lauterbrunnen, a small Alpine town where you would catch a railway connection. Back in Interlaken, the sky divers were parachuting into the center of the city (as they do every afternoon/evening). Sore and tired, I returned to the hostel. And here's the irony: The girl staying in my hostel room (from UCSC, studying abroad in Barcelona), hurt herself badly while snowboarding that day. She had to be airlifted to a hospital. I don't remember the exact injury, but I do know that she was going to be okay. Just think: That could have been me! I guess my beginner's luck helped get me through this day safely! I then met up with the Franklin College guys again. It was their last night there and they were just chilling in the hostel's lounge/attic, swapping more stories about their adventures on the slopes. Matt was the only one of the five who wanted to go out, so I joined him. We grabbed a döner at a small cafe near the West train station. Then we walked to a nearby pub (Buddy's Pub) for a beer. Then we wandered. We were trying to get to Balmer's Herberge, which is the biggest hostel in Interlaken. It was only three blocks away, but unsure of where we were exactly, Matt flagged down a taxi. The bar was only open for registered guests of the hostel, but Matt and I somehow talked our way in. There was a massive party on their dance floor. So ended day two in Switzerland. Filled with more experiences than I could imagine.